Yam mania defines ds106, and like my first yam yarn, I have space yams on my mind. 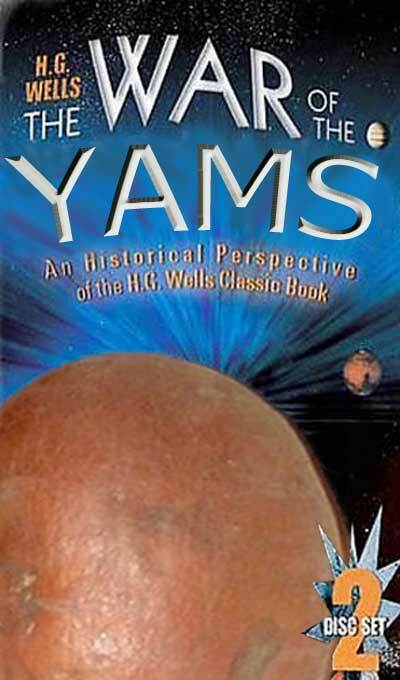 It’s 11PM and I’m photoshopping yams. This is the classic version, not the Spud Cruise one. We were hopelessly hemmed in by the Tuber Smoke all that day and the morning of the next. There were signs of people in the next house on Sunday evening–a face at a window and moving lights, and later the slamming of a door. But I do not know who these people were, nor what became of them. We saw nothing of them next day. The Tuber Smoke drifted slowly riverward all through Monday morning, creeping nearer and nearer to us, driving at last along the roadway outside the house that hid us. A Yammian came across the fields about midday, laying the stuff with a jet of ovenheated steam that hissed against the walls, splattered all the windows it touched, and scalded the curate’s hand as he fled out of the front room. When at last we crept across the sodden rooms and looked out again, the country northward was as though an orange spudstorm had passed over it. Looking towards the river, we were astonished to see an unaccountable maple flavored orangeness mingling with the black of the scorched meadows. That section was lifted and yammified slightly from the web version of War of the Worlds. In choosing a random passage to parody, I was struck by the references to Black Smoke in Wells’s text, and saw the eyeballs of JJ Abrams on the page. Maybe we will do a ds106 radio version of the Yamvasion? Ah, that partially explains all the yams on Flickr yesterday. No more Mr. potato Head!